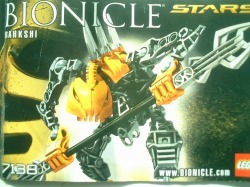 I think Rahkshi stars is the one of the best BIONICLE stars set becuase the very first Rahkshi were out in 2003 and now we are at 2010 so that means we haven't have Rahkshi for 7 years! yes seven years so it nice for Rahkshi to come back. I like how Rahkshi box is made because of the white bit behind Rahkshi, its looks really cool and it also looks like Rahkshi of light! I would rather have the Golden shield in Skrall set becuase i just rather have it with Skrall set but i don't really know why. 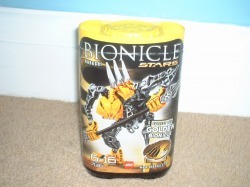 Here is the back of Rahkshi's set not much different from all the BIONICLE stars the only thing thats differnet is the bit bellow the BIONICLE logo where you see Rahkshi going in the box with a arrow at the top and,Rahkshi bit next to Tahu's shield. 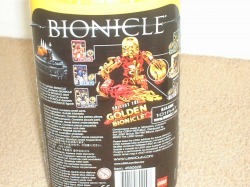 The anoying bit on all of the Stars sets is the bit at this back saying........ collect theGOLDEN BIONICLE becuase if you havn't got Tahu and you want to but him and you just wanna see him first,you can't look at the feet because it says....... collect the GOLDEN BIONICLE. 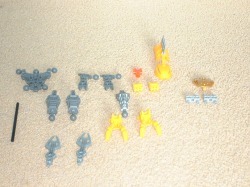 These are Rahkshi's pieces. 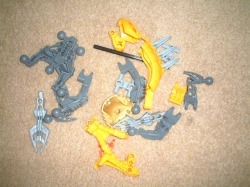 thers not many new pieces becuase the two hands are new, the Rahkshi's head bit's new and Rakshi's feet are new (well the hand and the feet are just new colour).i dont belive those pieces could create a medium sized bionicle becuase there's hardly any there and all thats the same with all the BIONICLE Stars and its funny there all the same (when i say all the same i mean they have stuff in common like the size). Thats Rahkshi's instruction booklet. Not very big like Rahkshi when its built if you turn on to page 1 you see Rakshi at the back of the fighting line (I just call it the fighting line), i think Rahkshi's there becuase Rakshi's were in 2003 but, Skrall should be first and Piraka should be second if you put it in timeline so Rahkshi's right becuase its at the back. This shows how many bits there are becuase i made it clear by putting the same pieces together. And in total there are: 18 pieces encluding the GOLDEN shield. This is what Rahkshi combined with Vorox looks like. 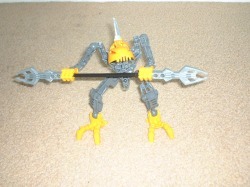 Vorox is also a good BIONICLE. 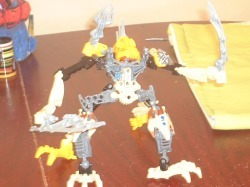 This is Rahkshi when he is complete and ready to face Tahu, Gresh & Takanuva. Its just too bad that he can't stick his staph into the ground but he's the only Rahkshi which is Akaku (Akaku means X ray vision) & heat vision! So Rahkshi is very lucky. 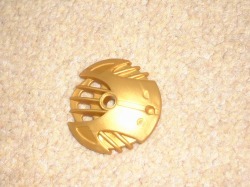 This is Rahkshi's GOLDEN piece when i got it, it wasn't very shiny dont know why though but i think its becuase i was ant my granny's house and it well wasn't very light. 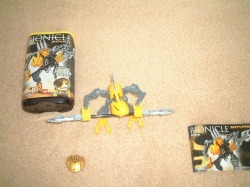 Full Rahkshi set is not a set its a set with a GOLDEN shield and a shiny GOLDEN shield.